Library Home / Hours & Locations / Rare Books and Special Collections / 2018 / September / 21 / Get to Know RBSC! Have you ever been curious about what we do or what we have at RBSC? 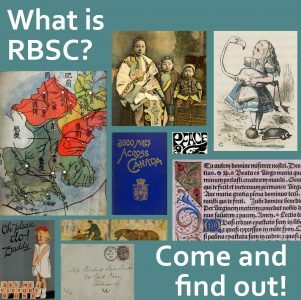 Join our weekly tour of Rare Books and Special Collections at the University of British Columbia Library for an introduction to our space and our unique materials and collections. Tours are free and open to the general public, as well as the UBC community. No need to RSVP, just drop in to learn what RBSC is all about! Every Wednesday at 11 a.m.
For more information, please contact Rare Books and Special Collections at (604) 822-2521 or rare.books@ubc.ca.